Bialetti Mukka Express Cappuccino Coffee Maker 2 cups is a coffee maker that can make cappuccino or latte directly on the stove. You just fill water in the bottom part, coffee in the filter and milk in the pot itself. Then Mukka Express is placed directly on the stove, the milk is heated and foamed, and mixed with the freshly brewed espresso. 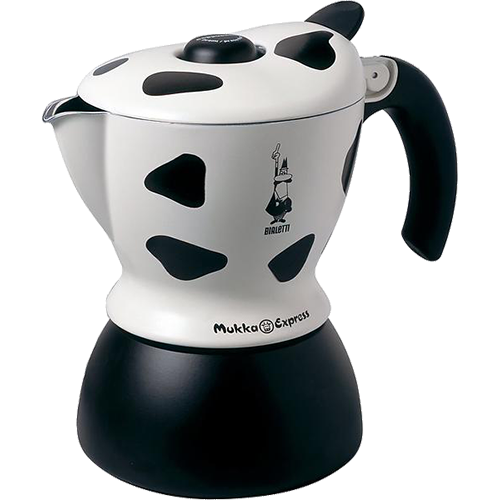 The Mukka coffee maker reminds of a dairy cow with its white color and black spots. Nice looking brewer which makes a great coffee!